When you’re looking for a dentist in or around Charleston or Teays Valley, WV, we at Smith Family Dentistry strive to be your premier choice. With our wide variety of dental services, including cosmetic dentistry , and dental implants, we’re able to cater to each and every one of your dental and oral needs. We’re also capable of providing pediatric dentistry for the youngest ones in your family. A healthy smile starts at a young age so we’ll be glad to be there for your child starting from his or her very first dental appointment. Primary teeth will serve as the guides for the eruption of permanent teeth. 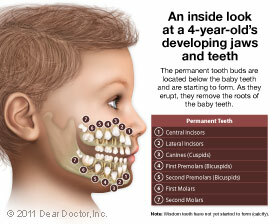 The primary teeth hold the proper spots open for the permanent teeth. Primary teeth will fall out naturally when the permanent teeth push against their roots. 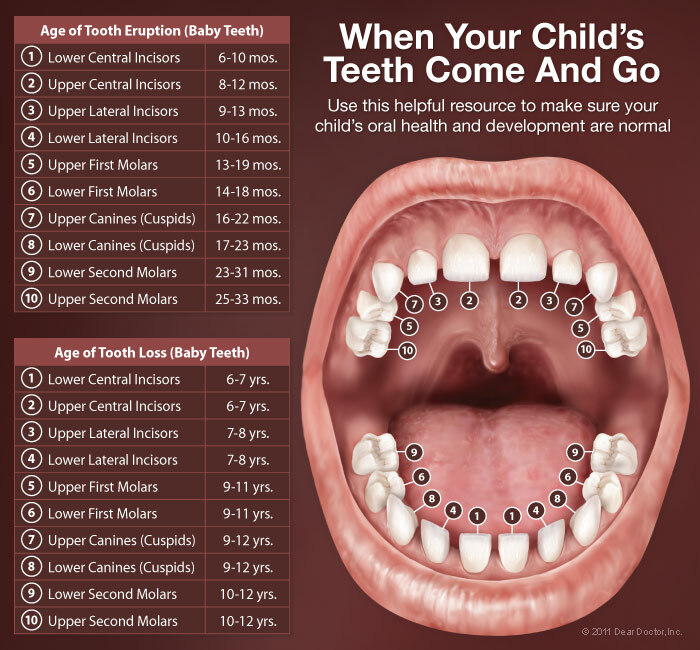 If any primary teeth fall out early, the permanent teeth may end up shifting into a more unfavorable position. Your child’s primary teeth will help him or her with many important daily activities throughout childhood, including speaking clearly and chewing properly. Learning to take proper and consistent care of primary teeth will help build healthy dental habits for a lifetime. 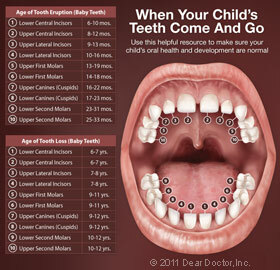 Your child will have 20 primary teeth, all typically appearing between the first six and nine months of age. The first teeth to erupt are usually the two lower front teeth, followed by the two upper ones. After that, the first molars will come in, followed by the canines. If your baby happens to experience any teething discomfort during this process, please don’t hesitate to let us know so that we can advise you on how to treat it best. The American Academy of Pediatric Dentistry recommends that you bring your child in to see a dentist by the time of his or her first birthday. By bringing your child in to see us, we can benefit your child’s dental health in a number of different ways, including checking for cavities, watching for developmental problems, and teaching you about proper oral hygiene techniques. Most importantly, we at Smith Family Dentistry want to make sure that your child has a positive experience visiting the dentist and becomes accepting of all the benefits that dentistry can offer. Topical Fluoride — Fluoride is beneficial because it will incorporate into the enamel of teeth, making teeth harder and more resistant to decay. While fluoride exists in drinking water and toothpaste, it’s only there in small quantities. In our Charleston, WV office, we’re able to apply a higher concentration on your child’s teeth in order to achieve an optimal level of protection (Watch Preventing Cavities in Kids Video). Dental Sealants — Dental sealants are plastic coatings that are applied to the chewing surfaces of a patient’s back teeth. These chewing surfaces contain small crevices that are perfect environments for decay-causing bacteria to get stuck in. Sealants will smooth out these grooves and prevent food from getting trapped. Sealants are easy to apply and will provide protection to teeth for many years to come (Watch Dental Sealant Video). Root Canal Treatment — Root canal treatment is useful for saving teeth that are badly injured or severely decayed. Root canals aren’t only used on permanent teeth – they can be used on primary teeth as well. Saving primary teeth may end up preventing your child from requiring orthodontic treatment in the future. Bonding — Bonding materials can be used to repair minor chips and fractures to a patient’s front teeth. These lifelike resins are made of plastic and glass and they can be used to fix both primary and permanent teeth (Watch Dental Bonding Video). 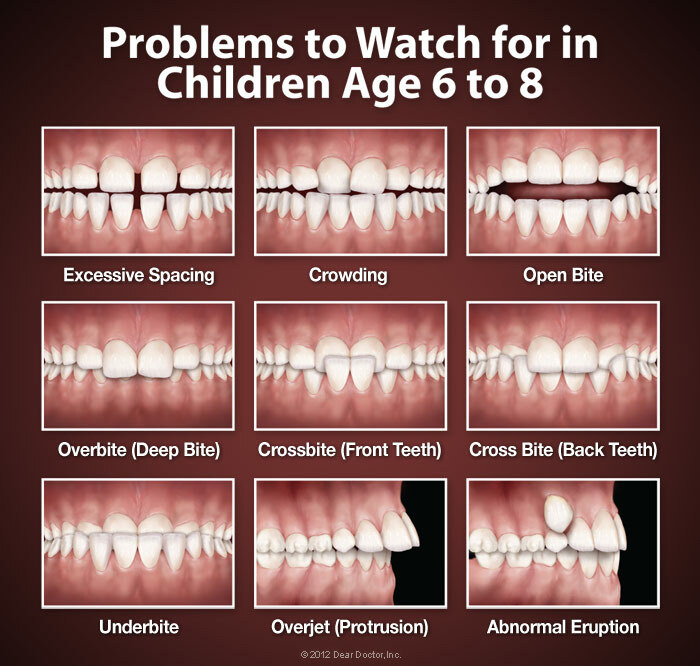 By the time your child reaches the age of seven, most orthodontic problems will be evident. Interceptive orthodontic treatment is useful around this time because an orthodontist can help direct proper tooth positioning and jaw growth so that later orthodontic treatment is simplified – or even eliminated. Because most orthodontic problems can be identified at the age of seven, you should have an orthodontist evaluate your child at around this time. Contact Your Charleston & Teays Valley, WV Dentist Today! If you happen to be looking for any of our treatments, such as cosmetic dentistry, periodontal therapy, and dental implants, we encourage you to give us a call at (304) 343-9131. Alternatively, you can fill out our online appointment request form. Feel free to contact us if you have any questions or comments. We hope to hear from you soon!